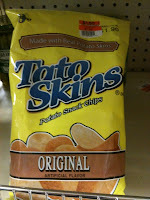 Gen Xtinct: Funky Food Friday: Tato Skins! Remember when suddenly eating potato skins no longer seemed like something a goat does? And TGI Friday's started serving them, hot and crisp and heaped with calorie-laden toppings, and suddenly people were ordering them before their meal and totally chowing down and then just pushing their main course around their plates? And then Keebler made Tato Skin chips, and they were kinda oval shaped and much firmer than regular potato chips and had that kind of dusty topping powder on them? And one side was darker than the other, like it was the skin side? And they were totally addictive and delicious in addition to being terrible for you? Well, Tato Skins vanished for a while and then I started seeing TGI Friday's own brand in stores. And then the other day I spotted the one in my photo here. So are they back? Did they never leave? Is this a different Tato Skin? It doesn't say Keebler, but it's definitely not the TGIF brand either. Wikipedia only recognizes the TGIF brand. But I did not buy them, and so now, the world may never know. Here's an old Keebler Tato Skins commercial from the 1980s. I love how two of the comment-leavers are practically coming to blows over what year it came out. "1984, DAMMIT!" "No, fool! 1988!" This is America, we fight only about the most vital issues! Please leave any comments on Tato Skins, TGIF, or other even vaguely related issues in the comments. We love comments! Have your say! I see the clearance sticker on there; they aren't 20 year old tato skins, are they? 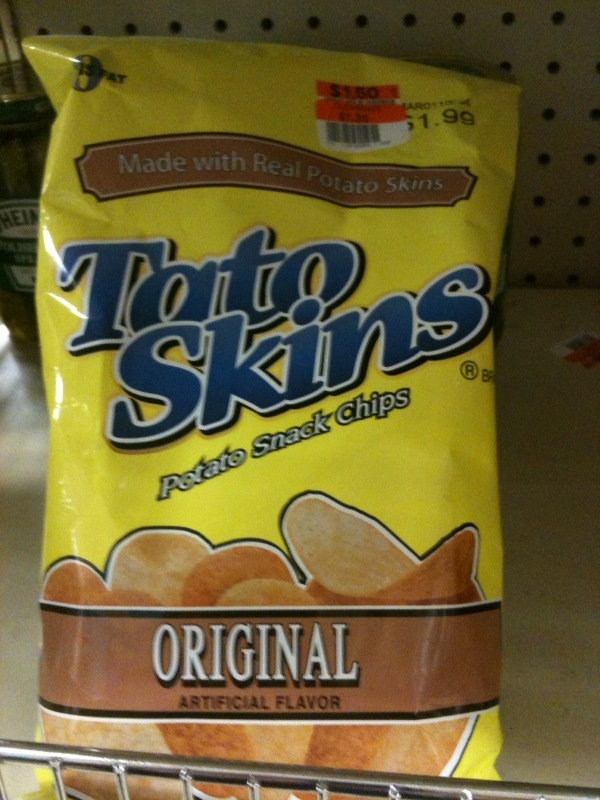 Oh man, I LOVED Tato Skins when I was a kid! I'm going to go out on a limb and say they came out in '88 because I was only 8 in 1984 and yet I could sing the jingle word for word prior to watching the commercial just now. I think my 12 year-old self would remember that better. But maybe not. Maybe my 8 year-old self salivated longingly over them and therefore memorized the song, which is pretty catchy. I always see these for sale at the dollar tree and they are not stale. They are like one of those weird but yummy snacks you can only get at dollar stores like cowtails! I am so relieved I'm not the only one who remembers that jingle so well I can sing along. They never really went away. I remember eating them on my break in my first job back in 1997, and when I went to a new town in '99 I got them there are well. Found them the whole while and can still get them.